Immediate Results with Hollywood’s Favorite Facial! This holiday season follow the stars of Hollywood with a HydraFacial treatment at SKIN the Spa at Runnels Center in Flowood. 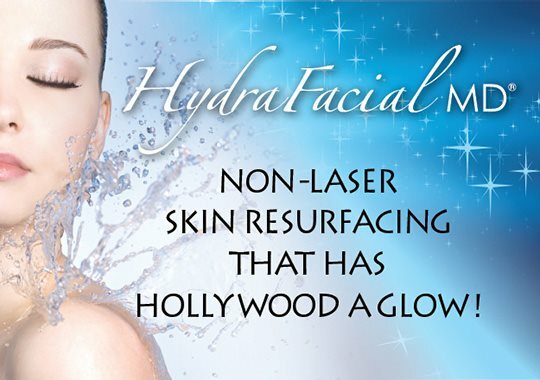 Celebrities such as Adrienne Maloof, Gabrielle Union, Evan Rachel Wood, Kate Winslet, Marie Osmond and Amy Poehler all use HydraFacial - a treatment that leaves skin radiant and healthy. Beneficial for everyone, the HydraFacial serums specifically target skin issues including sun damage, blackheads, whiteheads, pores, brown spots, uneven skin tone, and fine lines and wrinkles.The HydraFacial is a soothing, moisturizing, non-invasive skincare treatment for anyone who is looking to improve and maintain the health of their skin. Proven effective for all skin types, this 30-minute treatment delivers instant results with no discomfort or downtime. It's perfect for a last-minute treatment to help freshen-up your complexion before holiday parties, weddings, proms and formals, photo sessions, class reunions, and more! The non-invasive treatment shows immediate results with NO downtime. The acclaimed treatment was developed by Edge Systems Corporation, a worldwide leader in advanced aesthetic technologies. Located in Southern California, the company is known for its high quality, leading edge skincare products and systems. HydraFacial is Customizable, thanks to Add-on Boosters! Minimize signs of aging and even out your skin tone and texture, while addressing fine lines by adding this boost to your next HydraFacial session. Contains skin conditioning peptides, like acetyl octapeptide-3, that help this formula firm, soothe and hydrate your skin. Can help improve skin texture and tone. Enhancing cellular metabolism, reduces overall redness, accelerates replenishment and repair of skin damage, reduces wrinkles, and stimulates collagen and elastin production. Red LED light helps to reduce red and brown pigmentation, improves pore texture and size, increases the cellular turnover, circulation and moisture retention of the skin. Blue LED light is good for oily, confessed, inflamed or acne-prone skin, and is an alternative for those who don’t respond well to other acne therapies. This added enhancement to a HydraFacial session can improve the skin’s balance for a improved skin tone, firmer skin texture, and cleaner complexion. This gentle lymphatic message assists in the circulation of the skin by moving toxins out of lymph nodes and helping to drain stagnate cellular fluid, to give your face a youthful glow! Benefits include a reduction of fine lines and wrinkles, improved skin tone, reduction of puffy skin and swelling due to edema.